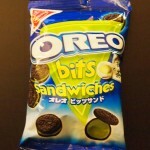 Review: Nabisco Oreo Bits Sandwiches Green Tea Creme | Oyatsu Break! 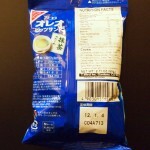 What, did you really think that the only snack food that the Japanese put their stamp on was Kit Kat? Heck no! Oreo are making big inroads into the Japanese snack food market, in regular versions and local variants including strawberry, apple, mango, and… Green Tea. A favoured flavour of Japanese snacks, a green tea iteration of Oreos seems inevitable in hindsight, and here they are in front of me! Thanks to Deb for the donation to the cause! 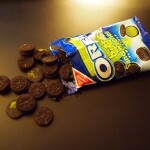 Packaging: A straight-forward variation on the standard Oreo white-and-blue packaging, the oreo bits foil pouch is attractively designed, easy to read, and clearly lets you know what to expect with pictures of the product AND what it’s supposed to taste like (Green Tea). The big green triangle on the back doesn’t feel very Japanese though, much more so than even Kit Kat these feel like American items. It’s maybe a bit boring? Or is that iconic? Scent: The aroma upon opening the bag is nice and strong, with a hint of Oreo chocolate cookie before the overwhelming scent of green tea. If you’re a green tea fan, you’re going to be delighted with how strong this smells, and it’ll really whet your appetite for how it tastes. Taste: Initially, the cookies taste exactly like Oreos, no surprise there. Despite being “bits” the chocolate cookies are exactly the same as you’ll find in North America. 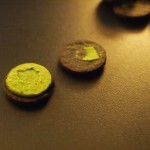 It’s when the creme hits your tongue that a big green tea flavour enters the picture. With a touch of bitterness and that big aroma, the green tea taste is really pleasing and big. But not so big that it overpowers the cookie, and what you end up with is a great balance of slightly sweet Oreo chocolate cookies and slightly bitter green tea creme, which makes a great combination. These are delicious, with the provision that you’re a green tea fan. 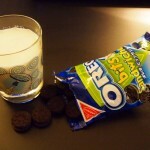 But what about… dunking them in milk?! Is it fair to take a food item that’s been removed from its cultural context, altered, and then reintroduce it into that context and judge how it tastes? No, no it is not. Did I do it anyway? Yes. 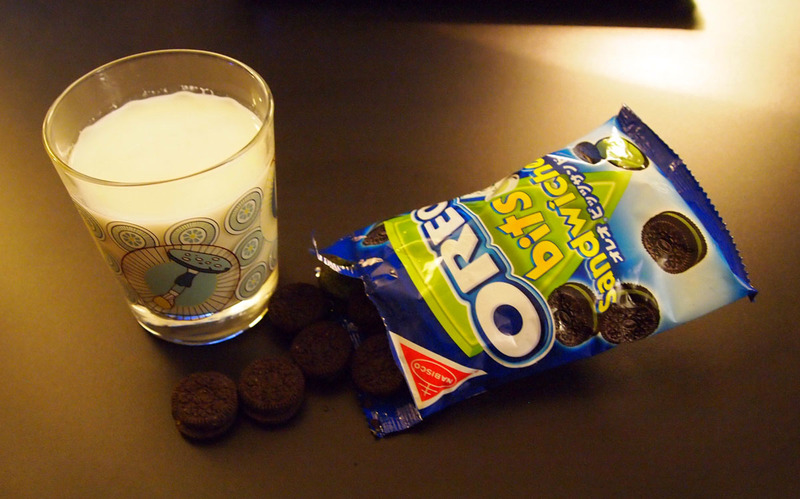 You can’t not dunk an oreo in milk, that’s a given. 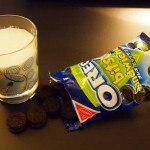 So of course I needed to try dunking the green tea Oreos. The results? Inconclusive. While I soaked the Oreo Bits as long as I could without them disintegrating, they still didn’t seem to soak up enough milk to really feel like an Oreo dunked in milk. A couple of different tries to get a good balance of milk and cookie were also mostly failures, so I feel like it’s maybe not fair to judge. But if you want my honest opinion, it’s a bit gross. The bitterness of the green tea creme actually brings out the bitterness in the milk, which helps to coat the inside of your mouth with a sort of bitter film. Did not enjoy it, but I’ll reserve judgement until I get some full-sized green tea Oreos to dunk. Verdict: While it’s not an improvement on the original Oreo cookie (I think they’re perfect as is, and aberations like double-stuff, chocolate, etc. 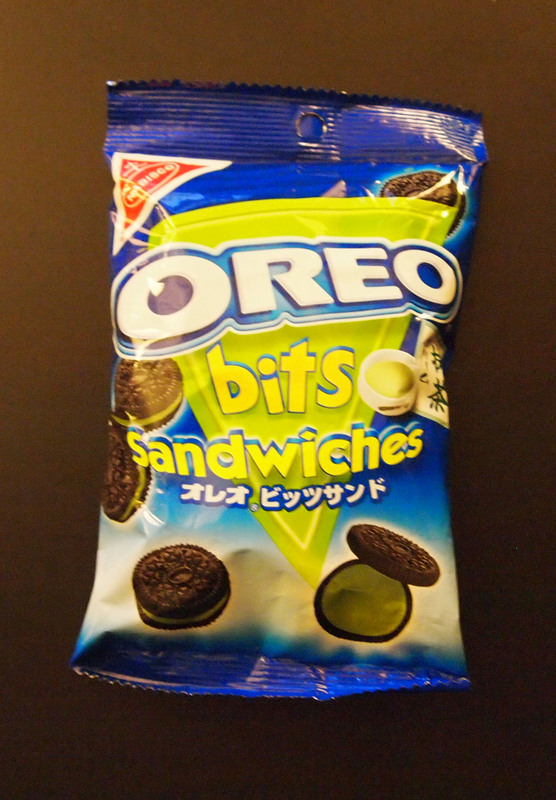 are all inferior), the Green Tea Oreo Bits seem like a great variation and I’d definitely buy a bag and eat them anytime I was looking for a snack. I just won’t go dunking them in milk. Wow, what a neat treat! I wish I could get these!! !